On July 13, Series 4—Colossal Warfare—goes on sale. This set makes up the back half of Over Realm Block, and features many powerful synergies with cards from Series 3. 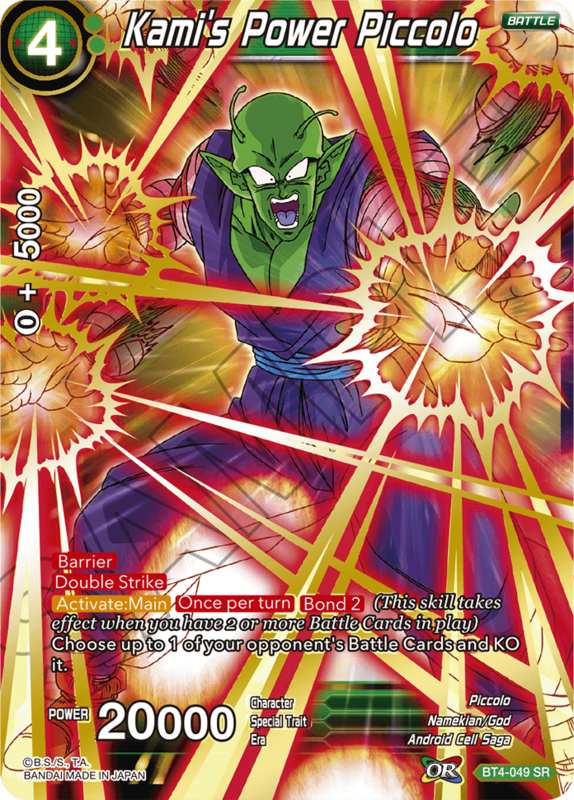 Blocks in the Dragon Ball Super Card Game are not used to specify which cards are tournament-legal, but to express a theme, with Series 3 and 4 focused around the skill Over Realm. This is jumping ahead a little bit, but Series 5 will mark the start of a new block. We’re taking current player opinion into consideration and looked into the unique qualities of each color in order to re-adjust the overall game balance. Our intent is to develop a card game that offers new strategies and deck archetypes while also supporting older cards for an even more enjoyable play experience. 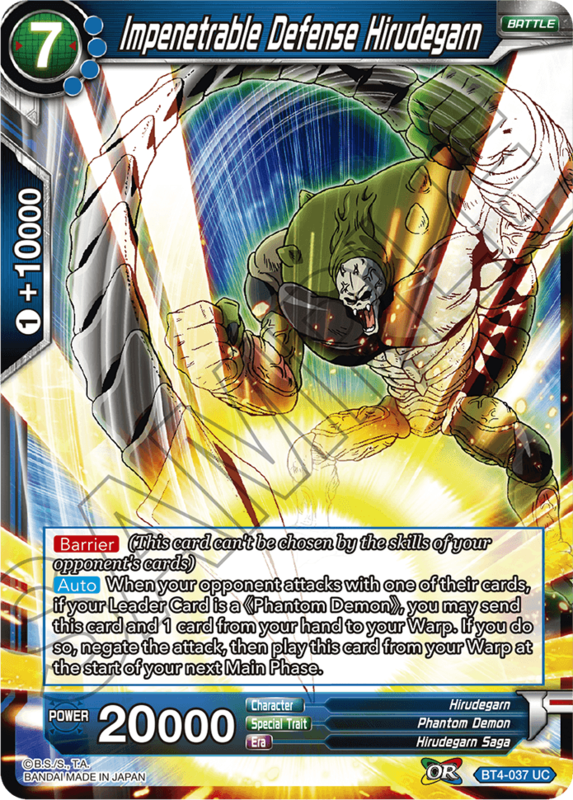 Colossal Warfare maintains the fast game speed that’s been present up to Series 3, while also offering a variety of appealing cards that open up even more fun possibilities. The two design concepts we focused on for this series were ① recreating the story and setting of the source material and ② making black-focused decks more viable. In the world of Colossal Warfare, the vile Xenoverse villain Demigra leads an army of colossal foes against our heroes. To really drive home the feeling of playing with these massive characters, each box includes a large-sized Leader Card that’s twice the size of a normal card. These large-sized cards are functionally identical to their normal-sized counterparts, and are tournament legal. Standing against these colossal foes are a lineup of “Goku’s Lineage” cards, which trace Goku’s family line from Bardock onwards. We hope that these cards provide a play experience that is true to the world of Dragon Ball and its thrilling, high-stakes battles. 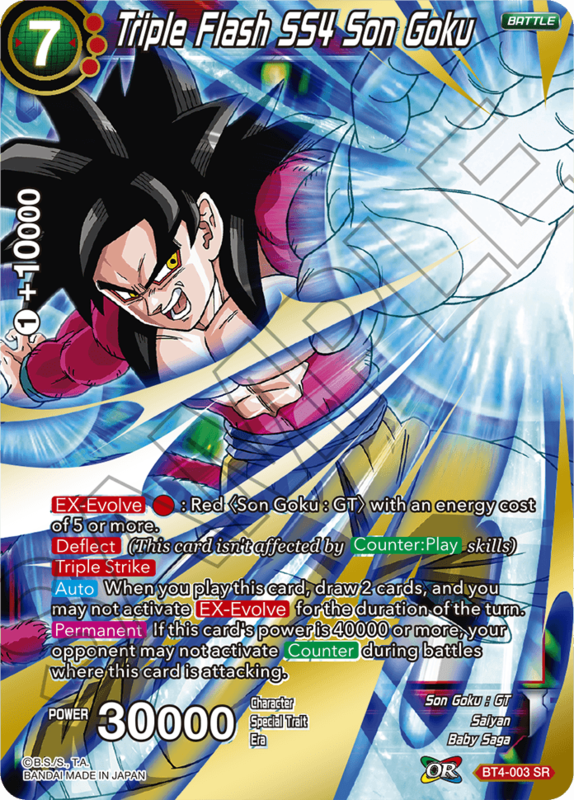 ・ <BT4-003 : Triple Flash SS4 Son Goku>—With [EX-Evolve], which debuted in Series 3, this card offers even more powerful options for Son Goku GT decks from the previous series. 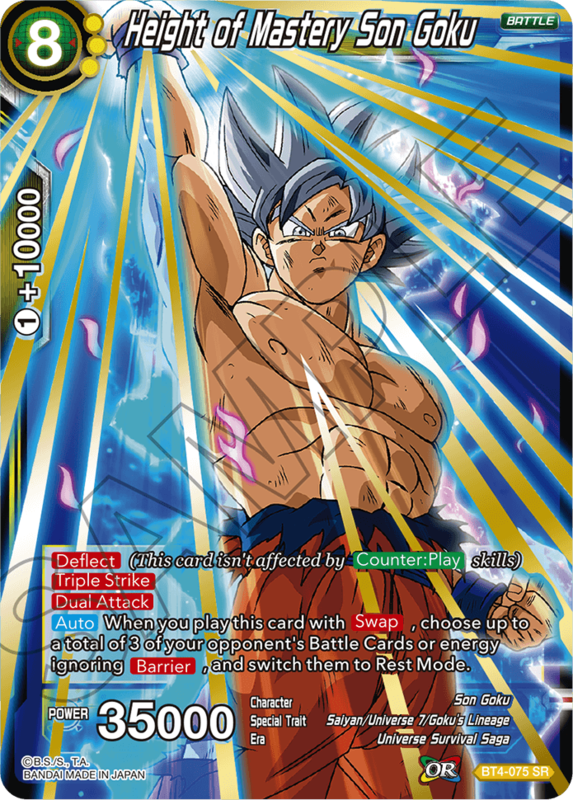 This Goku also has the new keyword skill [Deflect], making him extremely difficult to disrupt. 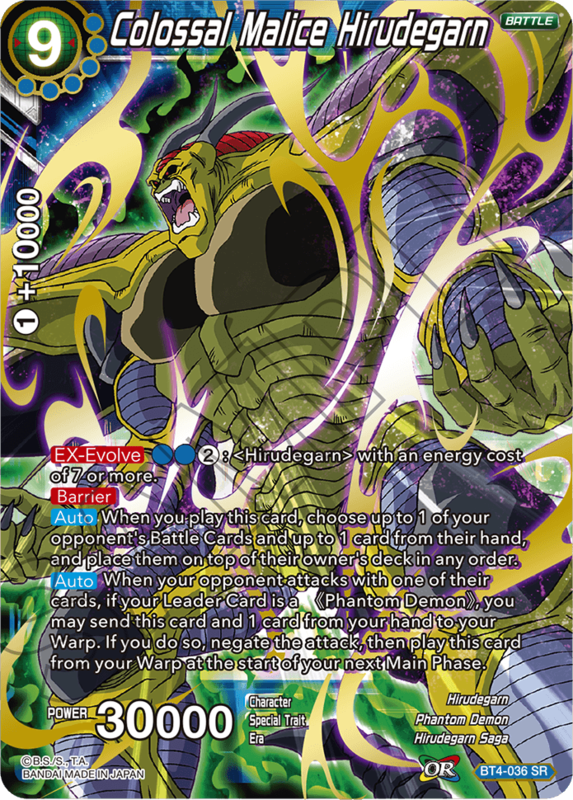 ・ <BT4-036 : Colossal Malice Hirudegarn> & <BT4-037 : Impenetrable Defense Hirudegarn> : Hirudegarn starts as nothing more than his sealed lower half, but meet the right conditions to break the seal, and you can play <BT4-037 : Impenetrable Defense Hirudegarn>, who, once summoned, is nearly impossible to defeat. 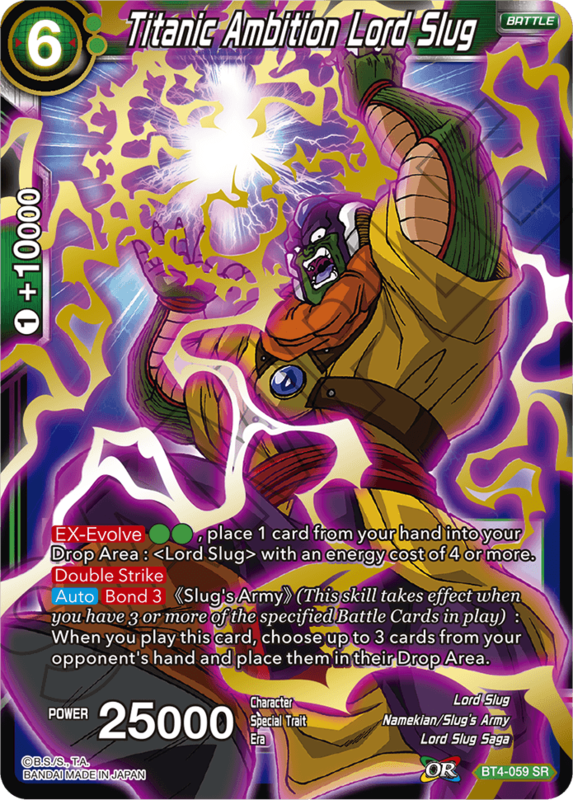 ・ <BT4-049 : Kami’s Power Piccolo> & <BT4-059 : Titanic Ambition Lord Slug> : Both of these cards have the new keyword skill [Bond]. Amass a legion of allied Battle Cards to unleash the Namekians’ unbreakable bond! <BT4-049 : Kami’s Power Piccolo> can KO an opponent’s Battle Card every turn, while <BT4-059 : Titanic Ambition Lord Slug> forces your opponent to discard tons of cards. 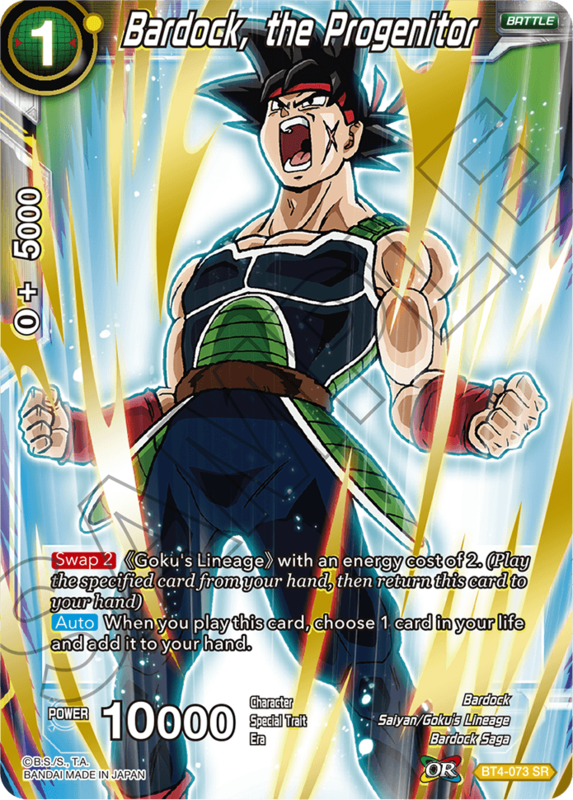 ・ <BT4-073 : Bardock, the Progenitor> & <BT4-075 : Height of Mastery Son Goku> : Use the new keyword skill [Swap] to link Bardock to other Goku’s Lineage cards, with <BT4-075 : Height of Mastery Son Goku> as your final goal. With Goku’s generation-spanning family entering the fray, colossal foes don’t stand a chance! 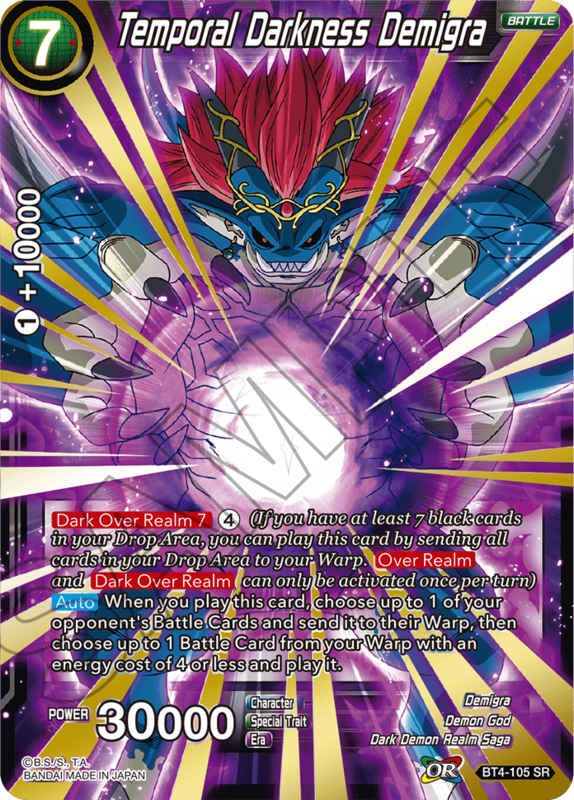 ・ <BT4-105 : Temporal Darkness Demigra> : A powerful card featuring [Dark Over Realm], a powerful new version of Series 3’s [Over Realm]. Unlike [Over Realm], cards with [Dark Over Realm] don’t get sent to your Warp at end of turn, and can also eliminate your opponent’s cards while calling Battle Cards back from your warp! Get Demigra into play, and the game’s as good as yours! This is just a sample of the fearsome foes appearing in Series 4—along with the heroes who stand to oppose them. Take a look at the card list or play with the cards at your local game store, and experience the world of Dragon Ball for yourself! The new black cards that appeared in Series 3 were intended primarily for support roles, but Series 4 introduces cards that make black-focused decks a very real option. Enjoy wielding the untold protean capabilities of these cards to seize victory! While each color offers a variety of linear strategies, Series 4 also offers a large number of flexible cards that can slot into all kinds of decks. Give them a look, and find the perfect card for a deck you can truly call your own! We’ll continue doing everything we can to develop a card game that fans of both Dragon Ball and card games can enjoy. Thanks again for all the support!